Moving a piano or organ is a difficult task, even with the right equipment and training. Not only can a piano be damaged if not properly moved, so can a home or building, as well as the people involved in moving a piano. Luckily, there is a professional Houston Piano Movers to help families and businesses successfully pack, transport, and deliver a piano to its new destination. It is best to hire professional Houston Piano movers at an affordable rate that have the expertise required to move a piano safely. This greatly reduces the risk of damage from occurring, which can cost much more than the piano moving service. We give our customers an accurate and affordable quote to help them budget their move. We train our staff with proper techniques regarding packing, loading, unloading, and relocation of pianos. We understand that a piano is an important part of property and treat it with great care while it is under our guard. We emphasis punctual deliveries for piano moves so customers can trust our estimated arrival times. Our professional Houston piano movers are experienced and know all the strategies it takes to safely move a piano from one location to another. Our trustworthy drivers are trained to drive carefully so the piano does not bump into things throughout its journey. It takes great dedication for each step when moving a piano. Instead of cutting corners, we thoroughly complete each packing step so the piano is protected for its move. Our Houston piano movers are available for local, interstate, and international piano moves. 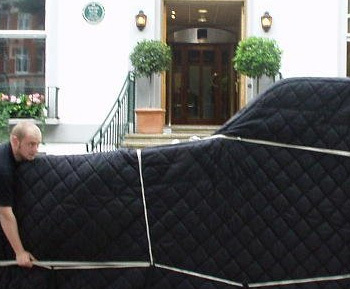 We transport residential and commercial pianos like they are our own. We offer piano storage and refurbishment to take all the hassle moving a piano can make away from you so you can concentrate on other tasks at hand. When relocating a piano in Houston TX or, whether down the street or across an ocean, we are there to make the move as stress-free as possible. Our Houston piano movers know our customers love their pianos and do everything they can to ensure the piano is delivered in the same, if not better, condition than as it left. Ask anyone who moved recently, and he or she will tell you moving for sure is not a relaxing endeavor.